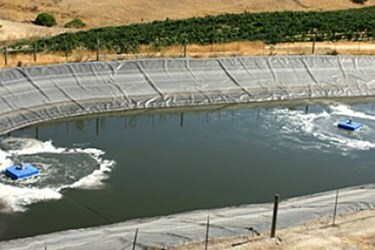 ClearBlu installs the most effective winery wastewater systems available. We are a design/build contractor. Utilizing biodigester technology, our capital costs for systems are significantly lower than other systems. Why? Because we are not utilizing municipal wastewater system technology to treat winery waste. They represent two different problems. Winery waste water contains sugars and grape organics. This narrow profile means that it is easier to treat. Typically engineering firms will spend 10’s or 100’s of thousands of dollars designing systems that are overly complex, very costly to install, difficult to operate and expensive to maintain. By focusing on the content of the waste stream, ClearBlu installs systems with much smaller footprints. If ponds are utilized, less than 24% of the acreage engineers require will be needed. We eliminate chemical usage by eliminating DAF and SAF systems. Our systems help clients save money and reduce their environmental impact through energy conservation and the elimination of chemicals. These systems help our clients to be confident that their wastewater is within compliance regulations without daily maintenance. Our systems eliminate the need for expensive pond dredging. Additionally, with water reclamation becoming ever more important in California, we strive to enable our clients to recycle water in a timely and effective manner. Our systems are applicable to any size winery. We build completely new systems as well as retrofit existing systems. Take a look at all of our Winery Case Studies, or read about one Napa Winery Benefiting from Green Reclamation Technology.